What Do Babies Dream About? Mothers may have more intuition when it comes to this question. I'd like to hear from them. But on the other hand, just a good imagination might give us some insight. So, anyone with any ideas, feel free to answer. Here, my great great niece is a mere 3 days old. Her world is so small. I would think her only concerns revolve around comfort; being fed, kept warm and clean, and her mother's soothing voice. But such a broad and powerful smile. Surely, whatever initiated that larger than life happy face goes beyond a few creature comforts. She hasn't yet learned language so whatever she's feeling is without words. 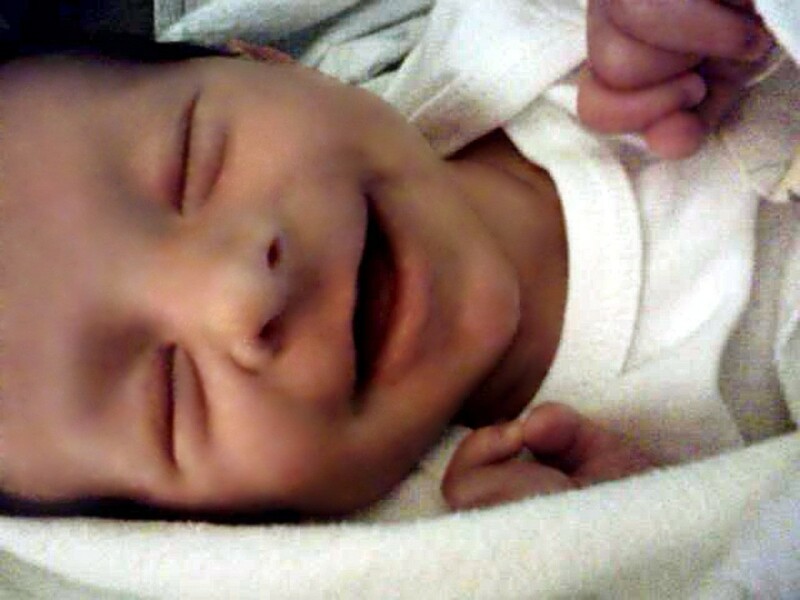 What is this baby dreaming about that would cause such a big smile on her cute little face? She's beautiful! Such a blessing!! I still want to believe it is them remembering the safe warmth of being in the womb and the memory of the sounds they heard...like mom's heartbeat and us talking to them through mom's belly tellinge couldn't wait to meet them. Thanks for sharing this sweet and heartwarming photo! May she always be blessed and happy!!! I don't buy the gas theory. I have so many different pictures of this baby, at this age, smiling while asleep, just as she is here. If the theory was true, this little girl could power a hot air balloon across the Atlantic. No, I think your theory may be much closer to the truth. I dont think anyone really knows. Maybe not, Judy, but isn't it nice to ponder these things? Many years ago I would watch one of my children "sleep" and wonder about the smiles and sometimes frowns that appeared on their usually calm faces. I always liked to think they had their own little make believe world that stayed with them until they began to adjust to the ever changing world we adults inhabit. This happy little world probably should last longer than it does. Maybe they are dreaming of being in the womb while their mother is having a good belly laugh, laughing can be contagious. :D What a cutie! I don't know what they dream of, But they look very cute at that moment.